Taking Your Brand Online – learn effective ways to tap the rapidly evolving online marketing space and create a greater web presence through the use of social media. 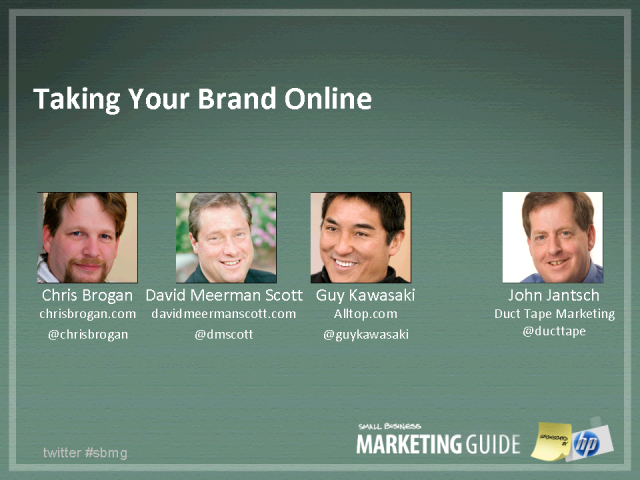 This webcast features Chris Brogan, David Meerman Scott, and Guy Kawasaki in conversation with John Jantsch. Just Get Started - How to get your startup business up and running right. This expert panel will discuss ways to generate leads using direct marketing tactics such as email marketing, direct mail and direct response advertising. Today’s marketing requires lots of content, lots of education, and lots of trust-building via expertise sharing. This panel discussion will feature practical tips and tactics from leading small business marketing experts. The "Truth" About Small Business Branding - using your small business brand to outsmart the competition - a panel discussion featuring practical branding tips and tactics from leading small business branding experts.